Today, it's all in how you look at it. The University of Houston presents this series about the machines that make our civilization run, and the people whose ingenuity created them. I'm holding an object in my hands. You look at it, and I ask you to draw what you see. You draw a rectangle, about four inches tall and an inch wide. I then rotate the object ninety degrees, and again ask you to draw what you see. This time, you draw something quite different: a perfect circle. The mathematics of geometry is filled with perplexing shapes, and we needn't look too far to find them. By too far, I mean beyond three dimensions. Higher dimensions are really no different than the three physical dimensions we live in - at least from a purely mathematical perspective. Four. Five. Twenty-six. For much of my career I worked with diamond-like shapes running into millions of dimensions. It turns out that a vast number of problems we find in the real world - from efficient bus scheduling to home package delivery - correspond to problems in higher dimensional geometry. But back to three dimensions. 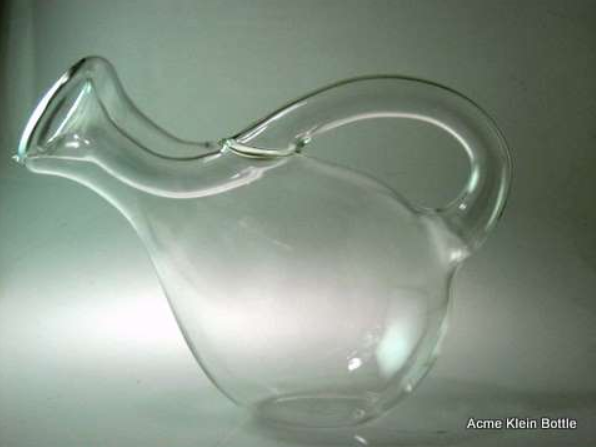 One very odd shape is the Klein bottle, named after the nineteenth century mathematician Felix Klein. Imagine an elegant wine decanter with one twist: to pour wine from it, you must first turn it upside down. When you again turn it right-side up, it's then that the wine pours out. Closely related to the Klein bottle is my favorite, the famous Möbius strip. You may well have bumped into it at some point. Cut a lengthwise strip from a piece of notebook paper - say, an inch wide. Now wrap it around bringing the ends together so that it looks like a one-inch wide circle. Now tape the ends together, but before you do, give the paper a half twist. With this added twist you've made a Möbius strip. Even though it's easy to make it's a bit difficult to visualize unless you've seen one. 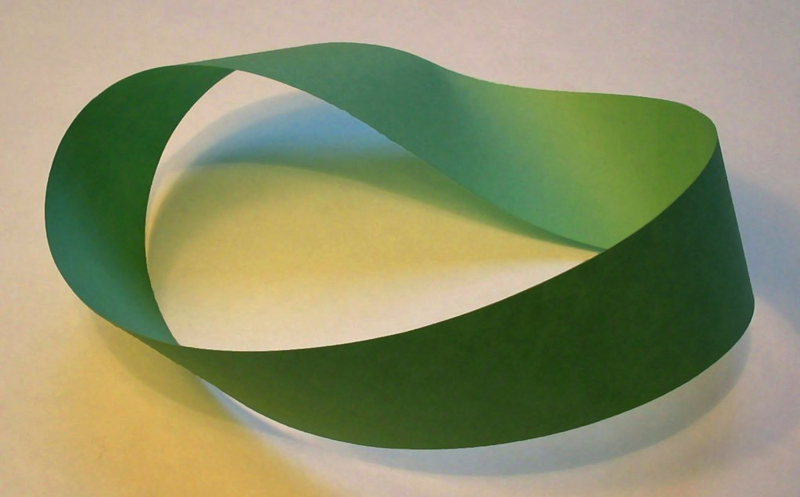 What's amazing about the Möbius strip is that we can perform magic with it. A warning. What I'm about to say sounds utterly crazy - which makes it that much more fun to try. If we cut the strip in half by cutting it lengthwise down the middle, we don't get two strips. Instead, we get a single strip that's twice as long as the original. How can that possibly be? It's as strange to watch as it is to describe. And the magic doesn't stop there. Let's again try cutting our Möbius strip in half lengthwise. But instead of cutting down the middle, let's cut one-third of the way from one side - two thirds from the other. This time we do get two strips. But one is twice as long as the other, and they're interlocked like two links in a chain. 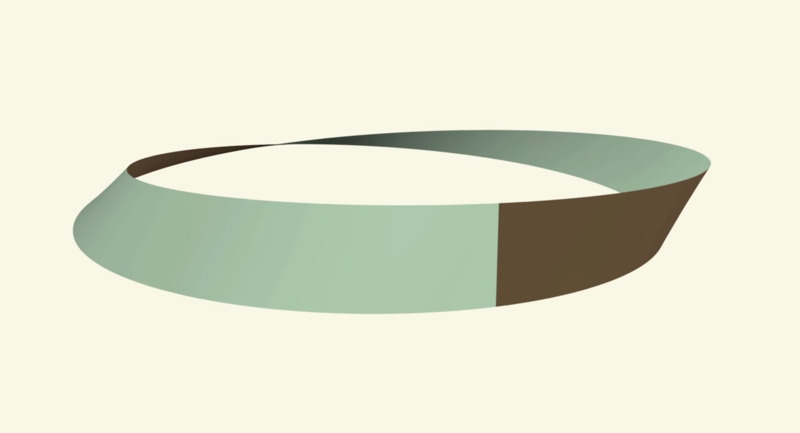 Animation - cutting a Möbius strip in half Click here. The list goes on and on. Fractals. Rubick's cube. Escher's drawings of impossible objects. We're faced with bewildering realities even as they unfold before our eyes. It's magic, but there's no trickery. It's simply the way our astonishing world works. 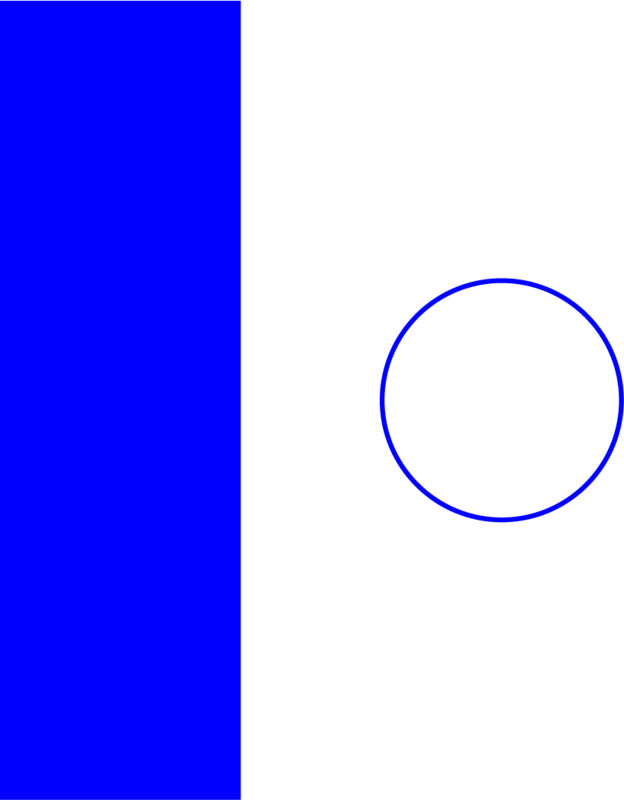 Oh, and remember that rectangle we rotated ninety degrees to look like a circle? I'm sad to say the figure behind it all really isn't that exciting. It's nothing more than a tube. 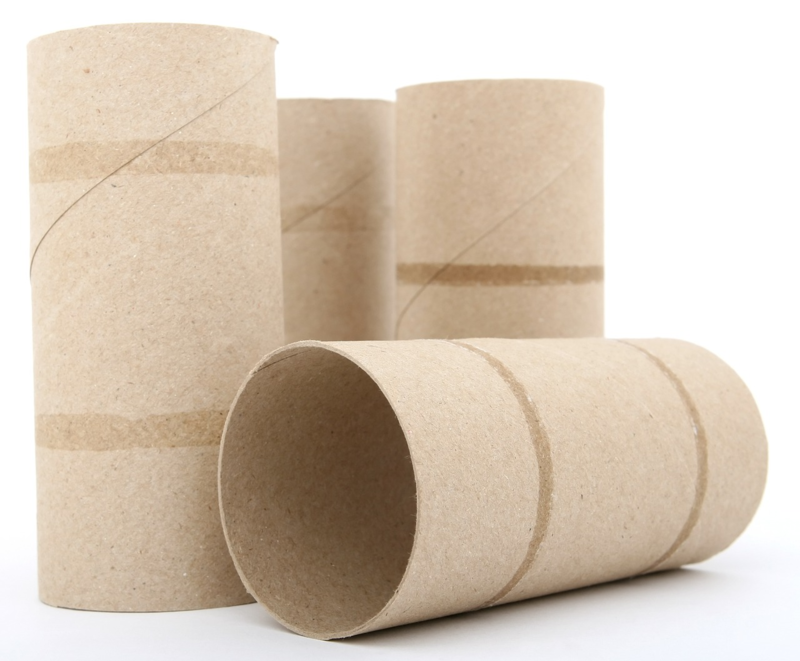 Take a look at the center of a roll of bathroom tissue sometime. The careful reader will note that when a tube is looked at from the side it isn't a perfect rectangle since, due to perspective, a slight rounding will appear at the ends of the tube. This can be addressed with a slight trimming of the ends (which doesn't affect the circularity when rotated), or simply by recognizing that the mathematics involved (projective geometry) avoids the issue of perspective altogether. When we see a tube from the side, most of us recognize it as a tube and not, for example, a wooden block because of our ability to recognize variations in light and shadow. The inspiration for this episode came from Michelle Comer at CCTY USA Bearing Company, who forwarded a video of a newly designed universal joint. Images can be found here. In particular, the rotating images at the end of the video show an elegant design that is rectangular from one perspective and circular from another. For a related episode, see MOBIUS. Möbius Strip. From the Wikipedia website: https://en.wikipedia.org/wiki/M%C3%B6bius_strip. Accessed August 6, 2018. Klein Bottle. From the Wikipedia website: https://en.wikipedia.org/wiki/Klein_bottle. Accessed August 6, 2018. 1988-2018 Copyright © The Engines of Our Ingenuity.